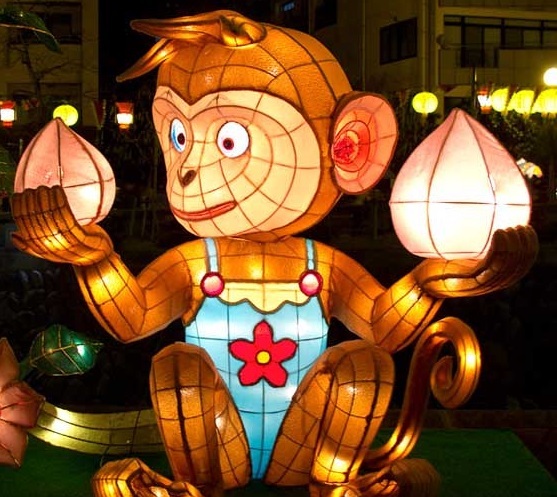 The monkey is the ninth animal in the Chinese zodiac and is considered clever and cheeky. People born in the Year of the Monkey are witty and intelligent with magnetic personalities and tend to be fast learners and astute opportunists. Personality traits such as mischievousness and curiosity mean that people often perceive monkeys as ‘naughty’. Return to our Chinese New Year Collection. 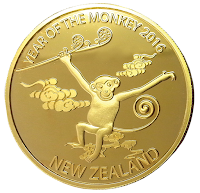 2016 Year of the Monkey. 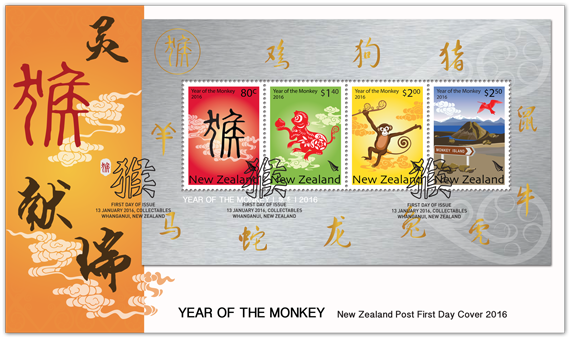 The 2016 Year of the Monkey was celebrated by New Zealand Post with another four value issue. Again the four designs each related to this years sign in different ways, giving us four more bright, colourful and different designs. 80c - Pictogram. $1.40 - Paper-cut Monkey. Again we see the symbolic pictogram on the lowest value. 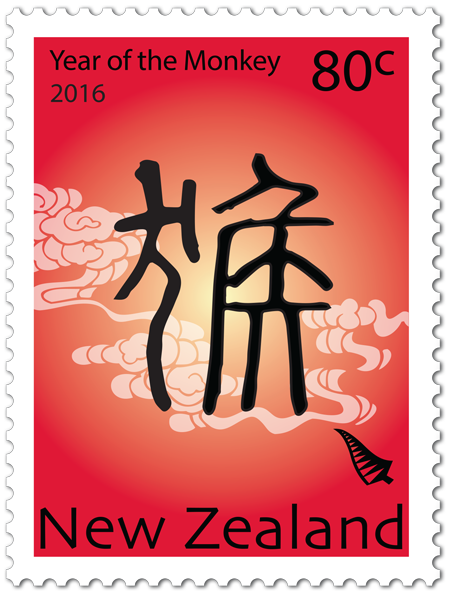 The red colour of this stamp mirrors the integral part that red plays in Chinese New Year. Together with the ancient pictographic character for ‘monkey’, the overall design is one of restrained style rooted in tradition. Paper cuttings are traditionally used as interior decorations during Chinese New Year. Contained within the design of this paper-cut monkey are Mäori cultural motifs, which bring the diverse Mäori and Chinese influences together. The monkey is depicted holding a peach, which is known as one of the best foods for monkeys. $2.00 - The Monkey. $2.50 - Monkey Island. 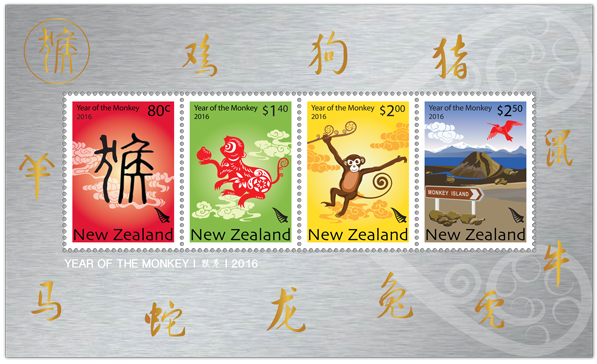 The monkey often appears in Chinese culture and is widely used to describe certain aspects of people and affairs. 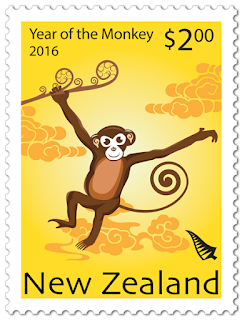 This design captures the monkey’s restless nature in a fun, exaggerated way. 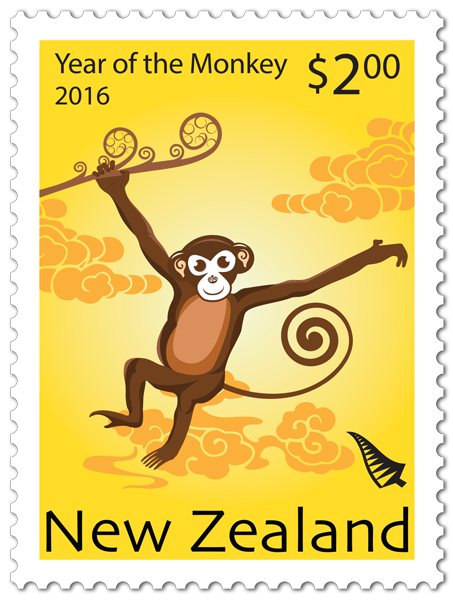 The silver fern frond from which it hangs and the curled shape of its long tail are features of New Zealand design that give the stamp a distinctly local feel. This spiral design appeared in the $1.40 value too. 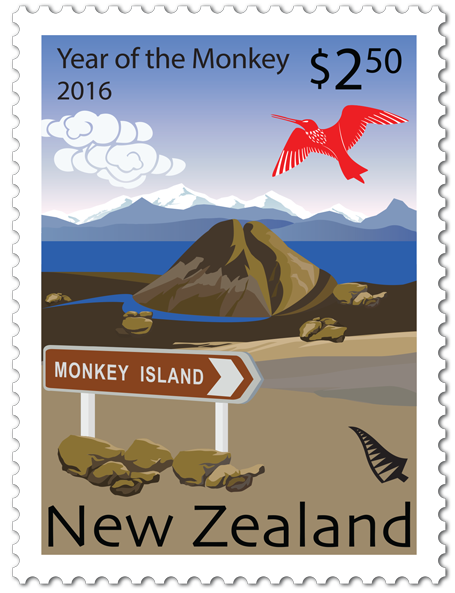 Monkey Island lies off the southern tip of New Zealand’s South Island, and is thought to be named after the ‘monkey winch’ that was used to haul boats ashore. The stamp design contains an artistic representation of Monkey Island’s landscape as well as a bar-tailed godwit, a migratory bird that flies annually from New Zealand to north-eastern China. Monkey Island; a small island and mini lagoon off the southern end of the beach is accessible during low tide, with a small walking track. Local Māori used the island as a traditional lookout for whales and named it 'Te Puka o Takitimu', or the 'Anchorstone of Takitimu' waka/canoe. 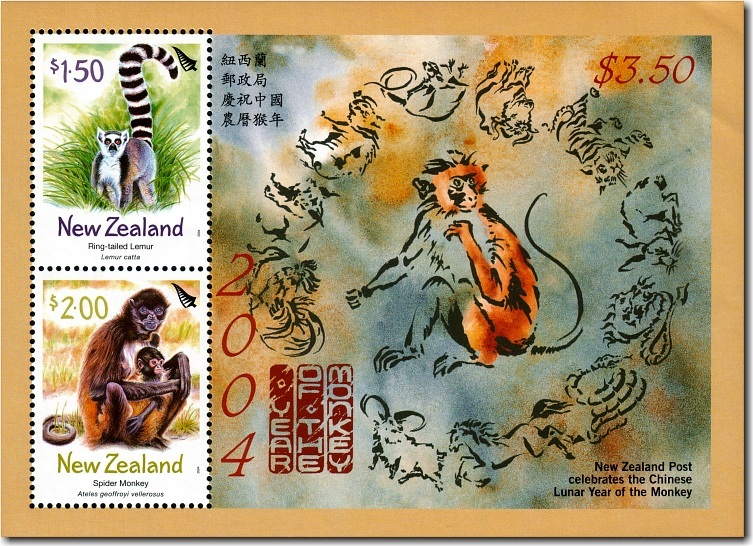 Once again the annual Miniature Sheet followed a similar design and format to previous recent years. 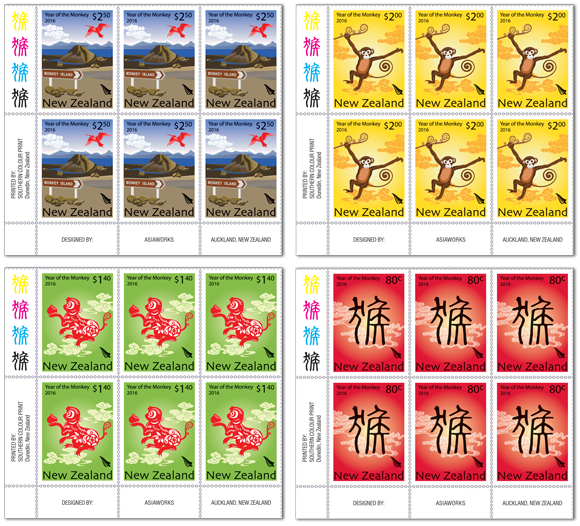 Once again all four stamps issued appeared on the miniature sheet. the Miniature Sheet, as shown below. important information such as designer, printer and printer information. This set shows the four full sheets. One from each stamp. 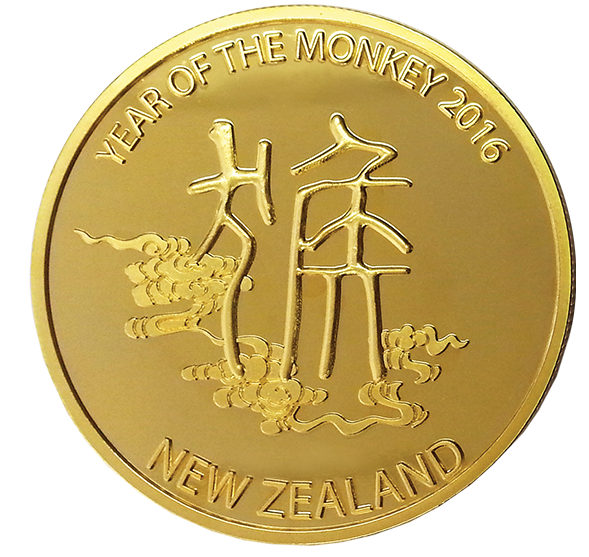 2016 Year of the Monkey Gold Plated Medallion. 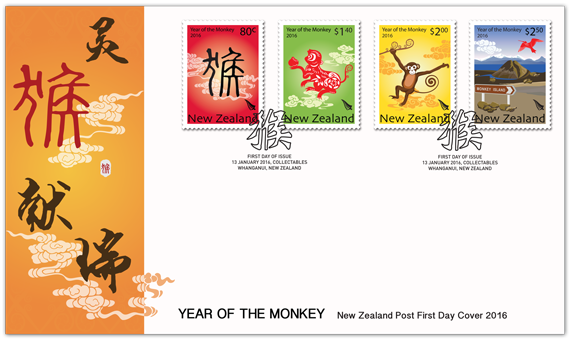 Right-hand Image - The back show the Chinese symbol of the monkey. 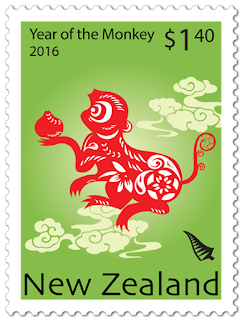 2004 Year of the Monkey. 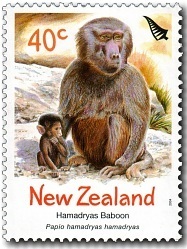 40c - Hamadryas Baboon. 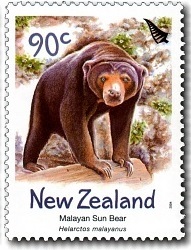 90c - Malayan Sun Bear. Known to travel up to 20 kilometres a day in search of food, the Hamadryas Baboon has adapted well to the dry, arid environments of Somalia, Ethiopia, Saudi Arabia and Yemen. These animals live in male-dominated communities of 100 or more, split into smaller 'harems' of an adult male and up to 10 females. At night, they sleep high up on rocky cliffs, away from the threats of predators. Malayan Sun Bear (Helarctos Malayanus). A native of Asia's dense tropical and subtropical forests, this smallest of bears reaches only about 1.2 to 1.5 metres in length. A nocturnal feeder, it is also very secretive during the day, preferring to spend its time high up in the trees and away from the tigers and clouded leopards that hunt it. 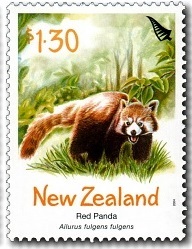 $1.30 - Red Panda. 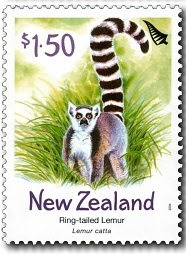 $1.50 - Ring-tailed Lemur. Once a carnivore, the Red Panda has adapted to its changing environment, and a shortage of food, over many thousands of years. Now it feeds mainly on the bamboo leaves found in its native habitat of the Himalayas. However, once again its existence is under threat, for the bamboo forests are rapidly disappearing through deforestation. The Ring-tailed Lemur is distinctive for its extraordinarily long tail and its ghostly, staring eyes. The species comes from the rocky, scrubby areas of Madagascar, where it prefers to live in trees and feed on its favourite fruit of figs and bananas. Highly sociable animals, Ring-tailed Lemurs make a delightful cat-like purring sound when stroked and groomed. Spider Monkey (Ateles Geoffroyi Vellerosus). The Spider Monkey is a true tree-dweller, using its exceptionally long tail to grasp and swing through the branches and its four limbs for walking, climbing, running and leaping - up to nine metres at a time. Living high among the trees in the rainforests of southern Mexico and Central America, these social animals live up to the age of 25 years in the wild. 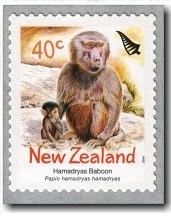 Hamadryas Baboon (Papio Hamadryas) (Self-Adhesive) Perf 11¼ from Booklet. Hamadryas Baboon (Papio Hamadryas) (Self-Adhesive) Perf 12¾ from Coil. 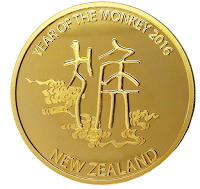 The current format was used again, this time with the monkey in the centre. All of the other signs have now moved around one place. 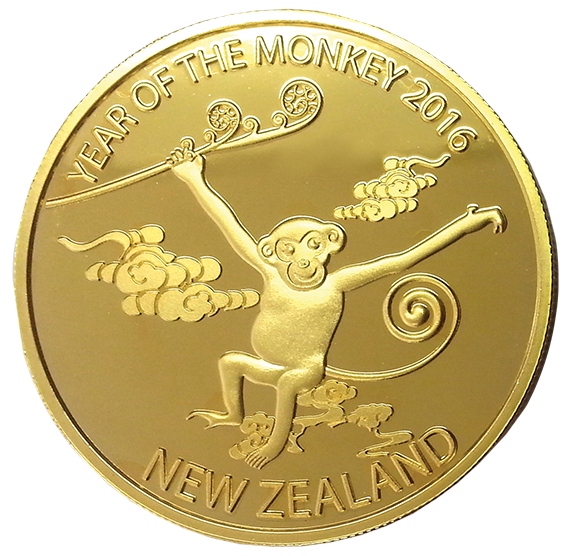 Technical information - Year of the Monkey 2016. Plate/Imprint blocks may be obtained by purchasing at least six stamps from a sheet. Barcode blocks are available in A and B formats. 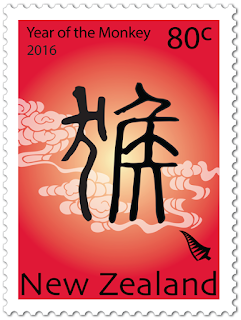 Unless stocks are exhausted earlier, these stamps will remain on sale until 12 January 2017. 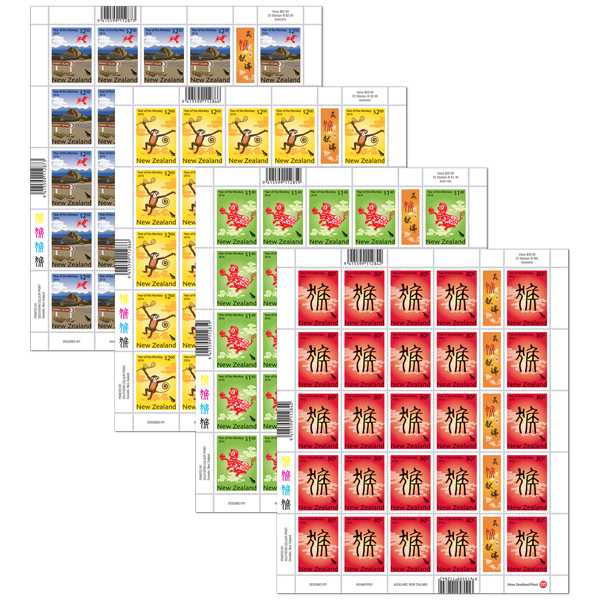 First day covers will remain on sale until 12 March 2016. Technical information - Year of the Monkey 2004. 1987 - 1989 Scenic Stamps. 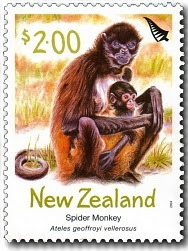 Captain Cook Stamps of New Zealand.